Within the darkest halls sheltering mysterious myths, legends and ancient tales, lies the utmost human desire to relish the craving of the imagination for stimulus. Nearly every story, every old saga or folklore, has a kind of magic that it is hard to grasp yet can easily be felt. Sometimes it matters who the narrator or storyteller, yet consuming on one’s own can also cause the same mystic excitement and rush of energy. The strong ties with Metal music might be the key for this written script, but it cannot be denied of its importance. With the introduction of Doom Metal, a gloomier aspect of Metal and Rock formed as an own Metal subgenre, mythologies and forgotten stories were provided with a celestial imagery. The sluggish tempos, simplicity of the riffs and their astounding unison with the keyboards, if there in the first place, can be a divine experience so fitting for a legend to be told. Though far from being the first, and certainly not last, the Italian Epic Doom Metal deciphers, CRIMSON DAWN, arose to show their appreciation for darkened tales and the enigmatic edges of fantasy. Debuting with “In Strange Aeons…”, via My Graveyard Productions, the Italians bear the message of the late 70s and early 80s, picturing the duskiness of BLACK SABBATH (Ozzy and Dio eras), DIO, HEAVY LOAD, early MANILLA ROAD and the NWOBHM efforts of WITCHFINDER GENERAL and the primal breed of ANGEL WITCH. While listening to “In Strange Aeons…” I came to notice that its course isn’t so easy to comprehend, yet in time, after a few cycles, it became apparent, quite clear for me to fathom. CRIMSON DAWN were able to recreate the developmental stage of Doom Metal as BLACK SABBATH provided it with a skeleton and a shape, submerging into its classic transition into the dawn of the early 80s. Orchestrating the gloominess of vintage, with a few peaks and squeaks into the barriers of progression, “In Strange Aeons…” isn’t what you would recognize as a memorable journey through yet another pit of darkness, it is a dawdling ride into the haze, atmospheric epic driven Metal chasing anthems with several rapid intrigues, hinting of a fuzz, keyboards inspired as a means of magnetism, riffing bounded by an old heritage traveling along with lead guitar fretwork inducing a sudden warmth as the vocal line speaks the wisdom of times that never where, ages that were existent under different consciousness. One might think of the unease of this release to be maybe the long length tracks, On the other hand, the long epics were the ones that designed the main scenery, an unclear path into the unknown, tale after tale, feeding the listener’s imagination and the yearning for the right musical setting to kick in. “Siege At The Golden Citadel” endorsing a melodic decoration of the Doom Metal proclamation, swallows for over nine minutes of war motivated myth, can’t be sure on which story it is based on. In terms of music, it has everything needed for the Metalhead to bear witness to a spectacle, majestic demonstration of fine composing and songwriting abilities. Certainly CRIMSON DAWN proved of their abilities to meld Folk features into their music, assembling another dimension into their known reality. “March of the Masters of Doom” and “Scorge of the Dead” hailing the DIOesque frontline back into recognition, moving in with a trail of an energetic matter at the ready, embroiling the murkiness of Doom Metal with a mystical anthems, as if these were calls to arms or a messages of bravery. “Cosmic Death” is the album’s darkest of expeditions, a BLACK SABBATHiah vibe all the way, a late 70s Metallic display, choir embraced with well written Keyboards lines, slick and smooth. Before wrapping this up, I must comment on Antonio Pecere, which at first ached a bit with its accent, that showcases quite a voice range even if not your classic Doom Metal raconteur, no doubt the perfect frontman for this genre’s needs. 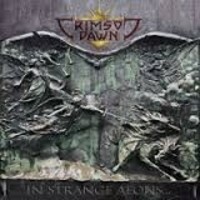 CRIMSON DAWN had no need on obtaining a new pressure point within the traditional Doom Metal fascination. True that there hasn’t been shortage of dreary instants, but in fact, it will take time to actually encircle into one’s mind. “In Strange Aeons…” might not be easy, but it is reachable enough for Metalheads to undertake its hold.